I used it because my shoes can not be put on my fracture. I used it because I can not put on my shoes with Gibbs at the time of fracture, It was very useful. This review is about item#09150881. 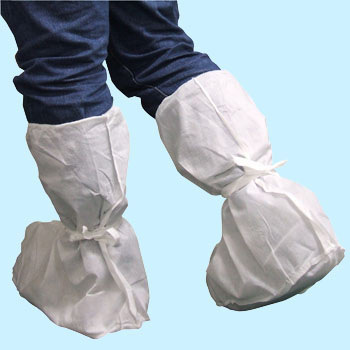 Because it is a deep wearing shoes, you can hide the shoes completely and do not get dirty! 2017, Gobi Great Mongolia, Mongolia, over the six days, prevented sand from entering the shoes when in the 250 km marathon dunes. About several 10 Km, the shoe sole part broke, but there was no invasion of sand. There was also a little breathability and less steaming. This review is about item#9150854. When entering shoes the entrance is narrow and it is hard to put on your shoes. On the contrary I feel that there is too much space to put shoes there. This review is about item#9150863. It has a length and can be bound tightly with a string, so it is difficult for dirt in washing to enter inside. Since white dust is conspicuous, it is also good to choose a dark blue color. It is a decision to repeat buying in the future. It is used for maintenance of machine equipment. It is used when you can not work unless you put your feet on the machine that should not get dirty. It is convenient because you can easily put on and take off. This review is about item#9150881. Despite the use of ascending and descending stairs, on asphalt, it was good durability. This review is about item#09150854. This review is about item#09150872. You can protect the shoes from dust generated when table saws and trimmers are used. Because it is cheap, it is good to be able to use it without worrying about it.